People often think of public speaking as a one-way deal: I speak, you listen. Mostly, the people who hold this assumption are bad speakers, because even in a formal speech situation listening to your audience – feeding off their verbal and non-verbal feedback – is how you achieve most speaking success. At the same time, you can see where the confusion arises. When a person is on a stage, maybe behind a lectern, and giving a speech, they are rarely engaging verbally in what we commonly recognise as a conversation. That means that “public speaking” often gets bracketed as something akin to shouting down a megaphone: getting your point across, as fully as possible. The truth is, though, that speaking is about dialogue – and not all forms of speaking are speeches. Even when alone on stage, you should be in dialogue with your audience … but, often and increasingly, you’re not even alone, either. The most important thing to do in these situations is listen. 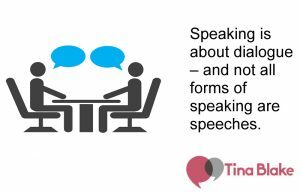 Like I say, every speech is like a conversation – you want to understand your audience and speak to them as if to a friend – but in an interview, whether for broadcast or live in front of an audience, focusing on the questions you are asked is so important. Audiences lose patience with evasive answers. “Canned answers” – ones you have prepared but which don’t quite align with the question actually asked – are a quick turn off too. Do your preparation – practice your key lines and even decide on the questions before hand if you can – but also don’t be afraid to freestyle within those plans. Listen and respond advisedly. Likewise, speak with energy. In an interview context, people want to see you engaging with those around you – and that means you should adopt a more conversational tone and style. Add a gesture here, a rising cadence there. Let you voice be expressive – it goes a long way. Be natural in other ways, too. If there’s a camera, don’t look straight at it throughout. Hold the eye of your interview, but don’t engage in a staring contest. Relax. A good speaker seems confident – and confidence comes from comfort. When there’s a conversation involved in your speaking engagement, treat it as an opportunity: to listen, to learn and to respond. In turn, your audiences will respond to you.